Parenting is hard. It’s also incredibly beautiful, fun and rewarding. But sometimes in the early days, it feels so overwhelming. I was at the park the other day with the kids in the late afternoon. It had been one of those days when you just NEED to get out of the house or you might not all survive till bedtime. When we got to the park I saw a mom I recognized. I didn’t actually “know” her, yet I knew her so intimately. She was sitting by herself on a bench holding her baby. She looked tired…the kind of tired you didn’t know existed till you had your first baby. She looked stressed, like a mom whose baby cries more than they don’t. She was probably at the park because the afternoon is the time of day that can break you. It’s the time of day you look at the clock and it seems as if the minutes don’t pass. It’s the time of day when a colicky baby just cries and cries. It’s the time of day you just need to get fresh air so you can breathe. I looked over at her a couple of times and did my best to convey empathy with a smile as I pushed my oldest in the swing and bounced my baby in the carrier. After a couple of minutes she came over and sat on one of the swings. I had an overwhelming urge to talk to her when I first saw her on the bench, so when she came and sat closer, I took it as a sign to strike up a conversation. I opened with the oh so popular “how old is your baby?” and we proceeded to talk for about an hour. Her daughter was almost 3 months old and had colic. She was having a rough day. We had a great chat about babies and colic remedies. I saw her look at me with that “she makes it look easy” look. I shot that down by letting her know that my little one was colicky too and had finally outgrown it. I told her how I would just walk around the neighborhood as he cried because there was nothing else I could do. I could see the relief wash over her as she looked at my calm, quiet, happy baby who once screamed all day. I could see the hope in her eyes that her little one would start to cry less and smile more. I promised her it gets easier. I validated her by letting her know that it’s not her, it’s just so so hard. I let her know that she’s not alone in this. I told her what worked for us that made it more manageable. I talked to her about things other than babies. I don’t know if her night went well. But I do know that for the hour we talked she was relaxed. She laughed. Her little one fell asleep while we talked. And as I walked home to feed my little rascals I felt incredible. There’s nothing like the feeling you get when you help someone. I feel like as moms we spend so much time tearing each other down. We judge each other. We doubt each other. We compare and compete. But where does that get any of us? ‘It takes a village’ is a phrase that is uttered over and over, yet today having a village is rare. We live in cities miles away from our family and friends. We raise babies without support. We go days, weeks, sometimes longer without adult interaction, time to ourselves and time to unwind. We go it alone. Perhaps if we spent more time reaching out and lifting each other up we wouldn’t have so much time to send a judgey comment on Facebook or give a disapproving look. This mother’s day while I celebrate the mothers I know and love, I want to also reach out and honor the mothers that need some uplifting. 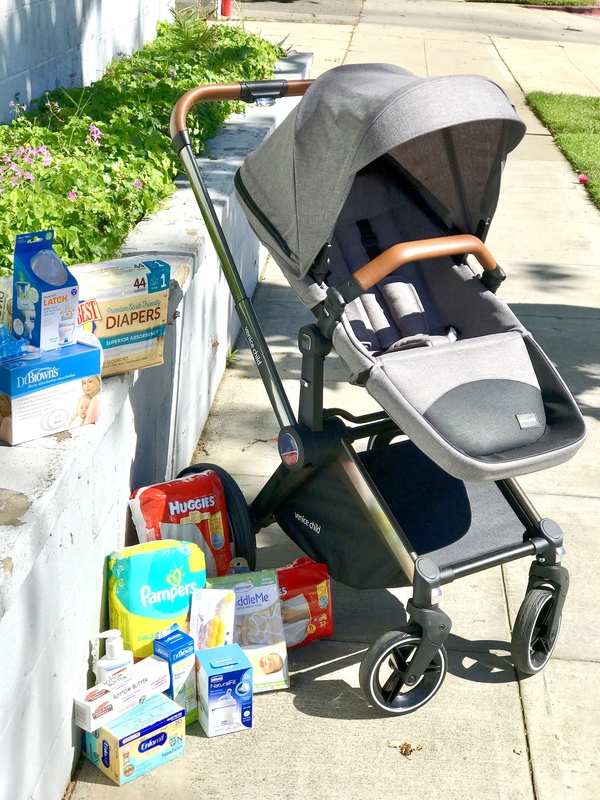 I was fortunate enough to have Venice Child reach out and offer me a brand new Kangaroo stroller to use and blog about. It’s a gorgeous stroller, born out of a fellow upstate New Yorker’s dream of creating an instagram worthy stroller that doesn’t cost a fortune. It’s a stroller that would make any new mom feel great to use. And while I would love to push around the beautiful brand new Venice Child Kangaroo Stroller, I have a perfectly good stroller from my oldest that may be 4 years old with some bumps and bruises, but gets the job done. Today I was able to bring the stroller packed full of newborn diapers, bottles and other new baby goodies to Harvest Home. I’m hoping that it will make a new mom’s Mother’s Day incredibly special. Maybe you don’t have a stroller to giveaway, maybe you do. But no matter what, even if you have nothing physical to give, you have the capability to make a monumental difference in a mom’s day. You have the ability to walk up to her after she handles an epic toddler meltdown in the grocery store and say, “you handled that so well..you are a great mom.” You are able to walk up to the new mom who seems to be wandering aimlessly and just talk to her so she doesn’t feel so alone. You are able to offer to hold the crying baby for a bit, to make funny faces at the fussy kid, distract and redirect the naughty toddler. Because you know that on one of ‘those days’ when bedtime seems forever away, and you feel like you have nothing left to give, even 2 minutes of someone else holding your baby, playing catch with your crazy toddler, or talking to you about something other than wet diapers and sleep schedules can make all the difference in the world. So tomorrow as you are celebrated for being the Rockin’ Mama that you are, take some time to lift up some other moms – whether you know them or not…cause we all could use a couple more villagers.